After waiting so many long years Google finally introduced Mobile-friendly themes for Blogger Platform but those themes were not of sheer quality because they lacked a lot in terms of designing and optimizing, the only impressive thing about them was their rapid Speed. In 2011, Google introduced Dynamic views theme for Desktop and now they have announced to bring Dynamic Views to Mobile. According to them, “We are bringing the speedy and improved reading experience to mobile users”. Unfortunately, it is not accurate because Dynamic Views theme lacks a lot whenever you try to access it from a mobile device. The Dynamic Views Theme For mobile is pretty much new so you can expect few bugs and minor hitches. 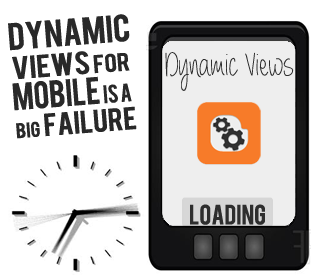 Today we will discuss the 5 Reasons why Dynamic Views could upset your Mobile users. To make the web faster on both desktop and Mobile devices, Google introduced a tool called Page Speed Analysis, which examine and calculates the time taken by a web page to load without any network breakage. Moreover, it gives a score out of 100 based on the speed of a single page of a website. However, the Dynamic views theme for Mobile has the lowest Page Speed score every recoded by a Blogger template and that is 72 out of 100, so the tool itself claims that it is a slow and sluggish theme. According to Matt Cutts, “Speeding up a website is a decent thing to do in general. Visitors that visit your site would be pleased and overall a faster web would be better for everyone”. Following is the screenshot captured from a blog that uses Dynamic views theme for mobile. In the above screenshot, we have compared the Google Speed Score of Dynamic Views and a normal blogger template for a mobile device. It shows that how the lazy Dynamic view is as compared to regular templates. Another blemish, we found while reviewing Dynamic Views theme on mobile was that it requires a real high speed internet connection. We do accept that, the world is changing and old phones are now replaced by advance Smartphones but the bulk of peoples are still using old mobile models to access the internet. However, we used an Android 2.3 smartphone with 1GHZ processor,256 MB Ram with 1Mb Wi-Fi connection and still it was taking too long to load, so those mobiles that don’t have Wi-Fi Connectively could never make use of a site that is using dynamic views template for mobiles. We browsed Dynamic views theme on a smartphone for one hour and literally it soaked up all the battery, and furthermore it consume lots of memory usage because of its heavy features that kills a speedy experience. However, this is not an enormous issue because if you have a high quality smartphone with bulks of RAM then you can easily navigate but for those who have dumpy phones would again and again receive an annoying message that “Your Web Browser Memory is Full” or “Clean up the Memory”. Another key lapse we found in the Dynamic views theme that literally changed our views about this theme. While we were browning it from a mobile, we found that it was not opening the entire post correctly instead it keeps on reloading the same page. For Instance, a visitor arrived on your website through a smartphone but on pressing Read more button the page started to load and keeps on loading till he abandon your site. Due to the low Google Speed Score Dynamic views template lacks a lot in terms of Speed. A User utilize mobile devices in order to get rapid results in seconds, but Dynamic views takes almost 30 seconds to load on a mobile with 1MB Wi-Fi connection, so you can imagine how long it will take on a sluggish internet connections. How you can expect someone to stick to your website even if you are not providing them with boundless experience, especially in terms of speed. Since, we have reached the 21st century the era know for development in information technology .it’s significant for every web owner to create a responsive mobile friendly website. We are not point mistakes in Dynamic views for our own benefit because it will create awareness to test things before implementing. We hope that Google will remove the minor bugs from this gorgeous theme till then peace, blessings and happy mobilizing. I think you miss the big problem associated with dynamic views for mobile. See this example of mine blog in a PC. There we can see only small part of article is showing in each post. Dynamic views for mobile will never show full article in mobiles if we are allowing partial blog feeds. So we can't never able to use dynamic views for mobile and partial blog feeds. Dude, We has test each and every thing if you have seen our Video then its quite clear that the Read More button does not Works Properly... And if their is no Partial Blog feeds allowed in mobile then it don't shows the complete posts. Sunil recently posted : 5 killer tips to protect your site from Google panda and multi colored popular post v3.